Sometimes, the most obvious answers are the hardest ones to provide – especially if you are UFC 155 judge Adalaide Byrd. Anyone with a pair of eyeballs and common sense could easily see Jamie Varner dominated Melvin Guillard (Pictured) on Saturday night. However, instead of crediting Varner with winning all three rounds against “The Young Assassin,” like her two fellow judges and everyone inside MGM Grand Garden Arena in Las Vegas did, Byrd scored it completely opposite by awarding Guillard with a 30-27 victory. What the? Who the? If you were to ask UFC president Dana White, Byrd didn’t realize she was supposed to be judging the fight that was CURRENTLY taking place just inches away from her face. “It’s unbelievable,” an agitated White expressed. 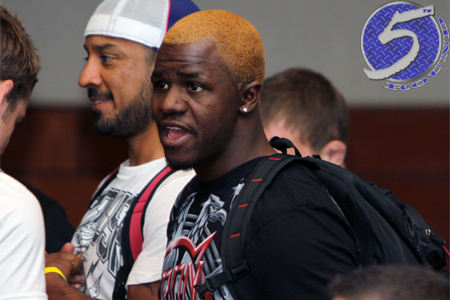 “Thirty-27 for Guillard? Crazy, right? You could never watch a fight in your [expletive] life and not score that 30-27. That’s so scary. You never know with these guys. It happens. These guys are crazy. Thankfully for Varner, he managed to escape with a split decision victory because Byrd was the only official who was watching a completely different scrap. However, it leaves the UFC in a lose-lose predicament because their hands are tied. “People think that it’s us,” White said of judge selection. “A lot of people aren’t educated on the fact that the Nevada State Athletic Commission actually picks these people and allows them to keep judging fights. As White has long preached, “Don’t leave it in the hands of the judges.” Fans certainly wouldn’t mind witnessing more spectacular finishes, either.